Hi there! 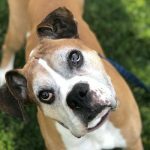 My husband and I adopted a boxer from you in 2006 and while it’s been a couple of years, I wanted to send an update and a couple of photos. His name at the time was “TJ”, but has been renamed Enzo. He was fostered by a wonderful woman named Eve, who we still keep in touch with. Not long after we adopted Enzo, I got pregnant, and we are now the parents of a beautiful 8 month old daughter. Enzo is the BEST big brother we could have hoped for – he is truly amazing with her and has been since the first day she came home from the hospital. As bouncy and playful as he is, he is always very gentle and tolerant with her, and he LOVES to kiss whatever he can reach (generally her feet or hands). I understand why you don’t adopt out to families with small children, but they are great dogs for kids. He’s actually better with her than our beagle is! I’m attaching two pictures of Isabella and Enzo – you can see how calm and gentle he is with her. He even tolerates her new favorite game – grabbing his lips and pulling while “talking” to him. She adores him and just loves being around him – he makes her smile and laugh all the time. She literally lights up and smiles when he walks into the room. Thank you for all the work you do to save these amazing dogs. 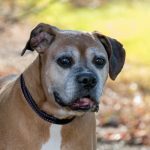 We will be forever grateful that you saved Enzo – he is a wonderful dog and we couldn’t be luckier to have him.